Champion trainer Paul Nicholls won his first Paddy Power Gold Cup as the Ruby Walsh-ridden Al Ferof put up a terrific performance under 11st 8lb. A past winner of Cheltenham's Supreme Novices' Hurdle, Al Ferof pulled clear of game runner-up Walkon - who was receiving 16lb - to score by three lengths. Nadiya De La Vega was a further 12 lengths back in third, but two fancied runners, favourite Grand Crus and Hunt Ball, pulled up. Of the winner, who carries the colours of John Hales, Nicholls said: "That was a stunning performance. He didn't get going until mid-September, but he had a gallop at Wincanton last Sunday, goes well fresh, and on Thursday he did a piece of work that was as good as any he's ever done. I knew he was coming right but I didn't expect him to go that well. "A lot of our second-season chasers are going well, like him and Silviniaco Conti, Cristal Bonus and Kauto Stone. They are all performing and I really don't think our horses were right all last season. We had a good season, but they didn't sparkle. They all look so well now. "He went over the top last spring but we were running him over a trip that was probably too short and he walked through the ditch in the Arkle Trophy. He's grown up since then." Coral make Al Ferof a 7/1 chance from 16/1 for Kempton's King George VI Chase on Boxing Day, and Nicholls said: "We will have to think about Kempton now. I've always wondered if he would stay that trip, but he stayed fine today so we'll have a chat with Ruby and John and see what they think. "If he runs there you won't see him beforehand because he is best when fresh. To carry that weight and do it so well today is wonderful." Of his first Paddy Power Gold Cup triumph, Nicholls said: "Class horses win this and some of our past runners haven't been well handicapped and probably weren't good enough. Ruby said this was the first one of ours he has ridden in the race that was cantering all the way." 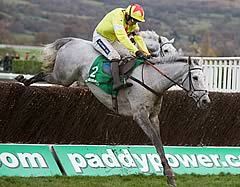 Ruby Walsh added: "It was a good performance - he travelled really well, jumped really well. He got a bit idle from the back of the last fence for a little bit but, once he got by the horse, he started to run again. "He was well prepared today - he hasn't run since Aintree, turned up today with 11st 8lb on his back and does it - but he is a class horse at the end of the day. You look at the previous winners of this race and you need a bit of class and that is why we were anxious to take our chance. "In fairness to the horse, we have probably been forcing him over two miles. He was never really on the bridle in the Supreme Novices', when he outstayed them, and I was forcing him in the Arkle, trying to get Sprinter Sacre at it. Stepping up in trip is maybe what we should be doing instead of trying to force him over the wrong trip." Alan King's Walkon was narrowly denied major honours at Cheltenham for a second time in his distinguished career when chasing home Al Ferof in the Grade Three Paddy Power Gold Cup, beaten three lengths. Nadiya De La Vega was 12 lengths back in third with a further six lengths back to Irish raider Casey Top. 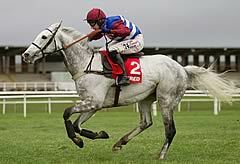 Walkon finished three-quarters of a length behind Nicky Henderson's Zaynar in the Grade One JCB Triumph Hurdle at the Cheltenham Festival in 2009. King said: "I am delighted with Walkon and he did everything right bar win. He was just beaten by a better horse on the day. There are no excuses, he has run a marvellous race and I am really proud of him. "Today was the plan and he could come back here in December, but we will see. He is probably better fresh." Nicky Henderson said of Nadiya De La Vega: "I am delighted with her. She has run another cracker." Leonard Whitmore, who trains Casey Top, said: "I am happy enough with Casey Top as we were afraid of the ground. His best form is on a better surface but he ran a cracker. "He had a nice weight and Mark (Enright) gave him a fantastic ride. He loved going round there and we will save him for the better ground." Both rider Tom Scudamore and trainer David Pipe said they had no idea why Grands Crus, the 7/4 favourite for the Paddy Power Gold Cup, ran poorly, being pulled up two out. Scudamore said: "At the third last, I thought we were going to go OK. But from there, he just got tired very, very quickly. "It is too early to say why or what happened. I was reasonably happy throughout but it was disappointing there was nothing there. There is nothing to say why he has not finished his race. "He has come back in one piece and, whatever has happened, we will sort it." Pipe added: "Grands Crus was beaten at an early stage. The ground should not have been a problem and we don't know why he ran disappointingly." Grands Crus lost a shoe in the race.